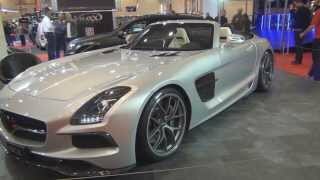 German based tuner INDEN Design has introduced their new Mercedes SLS AMG Borasca Roadster. Borasca is a Spanish word for storm and thunderstorm. 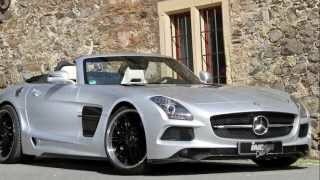 Joachim Inden has made some highly effective modifications of the sophisticated outer shell of the SLS AMG Roadster. The supercar gets an optimized aerodynamics body kit that includes a new front bumper, front spoiler lip made of carbon fiber and a new engine hood. It also has ventilated front fenders and new rear bumper with an integrated carbon fiber diffuser. There is also a stainless stell sports exhaust system with flap control and 21” alloy wheels with Continental tires. 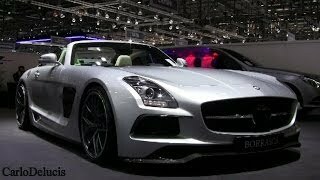 The 6.3-liter V8 engine now produces 635 HP (467 kW). More detailed specifications are not available. It can now accelerate from 0-60 mph in just 3.6 seconds.